When reading the ‘Browning Love Letters” I noticed that a “Penny Black” postage stamp was adhered to its envelope. 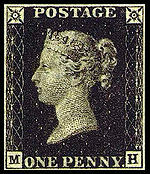 The Penny Black was the first stick on -postage stamp ever used. I knew of its existence, but not when it was first introduced. Browsing the internet, I came upon a website from the British Postal museum and Archive. We know that before the introduction of a stamp, postal duty was paid by the recipient and was based on the distance the letter had to be carried and on the amount of letters it contained. Sir Rowland Hill came up with the idea of a it use a pre-paid system in 1837. With this system, the person sending the letter had to pay the duty (the amount of which was based on its weight) rather than the addressee. The Penny Black came into actual use in 18 40. This entry was posted in 19th-century letters, letter writing. Bookmark the permalink. Could you give us the link to the online British postal museum and archive?